No frills - ZineWiki - the history and culture of zines, independent media and the small press. 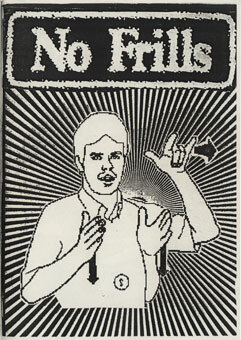 No frills (1998-2003) was a photocopied zine by Guy Sterling, published in over 10 sporadic issues in Sydney, NSW. The zine was "a collection of random findings, blatant appropriation and collages" and "a do-it-yourself guide to mayhem and mischief making, a humerous look at social issues and information on electronic/noise happenings, promoting local gigs and releases." This page was last modified on 17 January 2008, at 17:50.